Consider this statement from Jude 1:8. Jude is talking about ungodly people, false teachers who are already marked out for condemnation, grace-perverters. Joel’s prophecy (Joel 2:28-32) and its affirmation in Peter’s sermon show that the dreams in question may refer to revelatory dreams (rather than normal dreams). During the Tribulation, prophecies, revelations and visions that have now ceased will return, along with divine revelation. God will speak to people through dreams, just as he did earlier in biblical history )e.g., Joseph in Egypt, Daniel in Babylon, and others). At this point in writing the essay I decided to Google some quotes where a famous false teacher had mentioned dreams and end it there. I started with Beth Moore because she’s been around longest and had a higher likelihood of a quote somewhere regarding being a ‘dreamer’ as Jude puts it. I was absolutely shocked as this result came up on Youtube. It is a clip from the LifeToday program on television with James Robison from 6 years ago. At least, Moore mentions that she was 53 years old in the clip and she is 59 years old as of this writing. The 10-minute clip shows Moore describing a dream that she had had, and then its meaning and interpretation. But it’s worse than just a revelatory dream. Much worse. In the clip, Moore fervently affirms that she just loves Jesus so much and the dream ‘he’ gave her just makes her love ‘him’ all the more. Moore’s friend is Mary Beth Chapman, wife of Grammy and Dove Award winning recording artist, Steven Curtis Chapman. About a year and a half prior to Moore’s dream, her friend Mary Beth had tragically lost her adopted Chinese daughter Maria to a car accident. Mary Beth had been in deep grief. Moore opened by explaining that in all her 53 years she did not dream that vividly and she never had a dream from God. Though she’d repeatedly prayed and asked for Him to send her a dream, she explained that God ‘said’ to her that “some people are just safer with the Word on the page.” (1:31 in the clip. By the way, this is an admission that Moore seeks extrabiblical revelation, and that she knows exactly that dreams are extrabiblical revelation). Her dream involved seeing Mary Beth at a sound stage about to speak to an audience, with her dead daughter holding her hand, in a body and dressed in a white shirt with chunky bangs. At the time, Mary Beth Chapman hadn’t written her book and was not touring sound stages speaking to audiences. Not yet. The glaring problem with Moore’s description of the dead child is that the redeemed of heaven do not have bodies yet. Moore explained that every night she prays He would send her a dream or a manifestation, she seeks it earnestly. Luke 11:29 and Luke 11:16 state that an evil generation seeks a sign. So her first mistake was to test the Lord by continually asking for a dream or a manifestation. (her words). Her second mistake was not recognizing instantly that the dream she’d had was not from the Lord. Why? God abhors communing with the dead. It is a practice that He strenuously forbade the Israelites to engage in (Deuteronomy 18:10-12), calling it an abomination. The New Testament is also firm against sorcery, divination, and necromancy. (Galatians 5:19-21, Revelation 21:8). Moore’s third mistake was interpreting the dream herself. Genesis 40:8 plainly says that interpretations belong to God. Moore went on in the clip to interpret the dream herself. She said that the dream meant that Mary Beth was being called by God to speak in front of audiences. She further interpreted that God sent the dream to Moore and not to Chapman because it was too soon after the accident for Chapman as a mother to be able to handle seeing her daughter. Chapman said in an interview that she had desired a dream, too. She and her husband desired to see their dead daughter. Moore’s dream is the exact definition of necromancy. In OT times, doing what Moore did, summoning a dream or a manifestation of a dead person and basing personal interpretations of future events on that dream was punishable by death. Jude disparaged ‘dreamers’ and their reliance on their ‘dreams’ because dreaming is a dangerous activity. Sin never sits still. It deepens. It begins with one little sin not repented of, and another and another. It continues with straying from church, the Bible, prayer. It deepens with increased satanic activity surrounding you, traversing the abominable territory into personal revelations. Once a false teacher is comfortable with constant alleged personal revelations, then come the dreams, and then the necromancy, and finally, death, either sooner or later. In Saul’s case, in the one and only case of communing with the dead, the Lord allowed a summoning of Samuel the Prophet through the Witch of Endor to demonstrate to Saul how far gone he was into the deep things of satan.You also notice that the witch already had a “familiar spirit.” (KJV). Samuel’s appearance was only to confirm Saul’s imminent doom. This essay has a two-fold purpose. One, to show you again, how deeply Moore is apostate, and to warn you to avoid her. Secondly it is to remind you (and me) that sin never sits still, it is always on the move, prowling. (1 Peter 5:8). As sin moves, it deepens. It gets worse over time if unrepented of, never better. There are only two ways to go in our walk on earth. One will be on the narrow road or on the broad road. One leads to destruction and eternal death, one leads to eternal life. Walk, or as Paul sometimes said, run, indicates movement. Sin never stays still. You either move toward the “deep things of God” (1 Corinthians 2:10) or you move toward the deep things of satan (Revelation 2:24). When one begins to seek voices and personal direct revelation from God and accept them, one is already far down the path of the deeper things of satan. When one dreams and believes the dreams are from God, it’s a dangerous thing. You then begin relying on the dreams and not “the Word on the page” (as Moore admitted above). Jude says of those who rely on dreams “defile the flesh, reject authority, and blaspheme the glorious ones.” When dreams turn to summoning the dead, and interpreting their activity into future earthly events, you’re already an abomination to God because you are a necromancer. Necromancers do not go to heaven. I’m posting these screen shots of the video with closed captioning in case the video is deleted (which Moore’s criticized videos often are.) I also saved the transcript of the video and I’ll post that if the video is deleted later. Here, Moore admits she constantly asks God to show her a manifestation or give her a dream. Here, Moore claims to see Mary Beth Chapman’s dead child Maria in body and describes her face, hair and clothes. 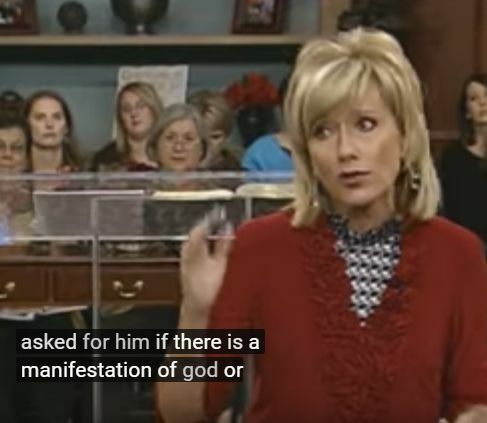 When she said she gets nervous before she speaks, I shouted, “You’d better get nervous, Beth Moore!” She all but admitted right there that she’s a false teacher! I appreciate your blog and the way you use discernment to reveal false teachers. I have taken note of the many women Bible teachers you accuse of being teachers of false or unsound doctrine. My question for you is, who are the women Bible study teachers and writers you recommend to us. I head up my church’s women’s ministry and am always looking for good quality studies for my women that “rightly divide the Word of truth”. Thank you. You can also look at the blogroll, I only put people on the list that I trust.